A long, empty road and the dramatic rays of light at end of day inspired this art by oil painter Janice Druian. Oil painter Janice Druian’s exhibit of new artworks, “High Desert Light”, opens at Tumalo Art Co. July 6, from 4-8pm during the First Friday Gallery Walk in Bend’s Old Mill District. 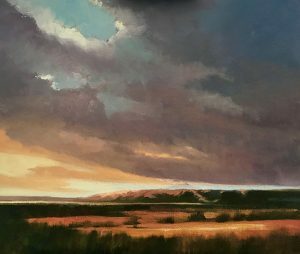 Inspired by such great painters as Maynard Dixon and Edgar Payne, Janice is drawn to the limitless vistas of the high desert, it’s monumental cloud formations and has been capturing the dramatic light as seen in the high desert for many years. Traversing the back country in her tiny trailer with husband and dogs, there is no scenery that touches Janice’s soul more than the high plateaus of Central and Eastern Oregon and Northeastern California. 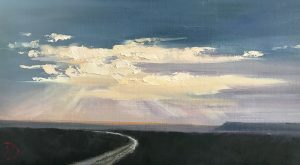 In the paintings she creatres her focus is the fleeting moments at sunrise or sunset when the oblique light creates a special magic often referred to as the “golden hour.” Usually accompanied by dramatic cloud formations, these landscapes offer endless inspiration and capture the essence of the western high desert. “Dawn Arrives” a dramatic oil painting for High Desert Light by Janice Druian. An award-winning oil painter, Janice was invited to the Borrego Springs Plein Air Invitational for four years in a row. Janice won Best of Show Los Gatos California Invitational in 2012. This year she has been invited to the juried show at the High Desert Museum for the fifth time and the Favell Museum Art Show and Sale for the fourth year. Janice was featured along with nine other artists in Artists’ Magazine in 2017. Tumalo Art Co. is an artist-run gallery in the heart of the Old Mill District in Bend, Oregon. The gallery is open seven days a week and hosts openings during Bend’s First Friday Gallery Walk every month. For information call 541-385-9144.